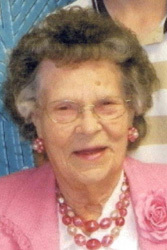 Maggie Elma Patterson Gage, age 98, of Joplin, went home to the Lord on Tuesday, Nov. 1, 2011, at Joplin Health and Rehab. Maggie was born on Sept. 26, 1913, in Medicine Mounds, Texas, the daughter of the late Charles Wesley and Victoria Elizabeth (Pittman) Patterson. She married Morgan Neil Gage on April 17, 1934, in Floydada, Texas. Together they made their home in Childress, Texas, where they owned and operated the Gage Food Store. Maggie moved to Joplin in October of 2006. She was a former member of the Childress Church of Christ in Childress, and the Rockport Church of Christ in Rockport, Texas. She was active in many church activities and very hospitable. For the past five years she was a member of the Mount Hope Church of Christ in Joplin. Maggie had a beautiful voice. In her younger days she sang in several quartets. She enjoyed sewing and crocheting. She was preceded in death by her husband, Morgan Neil Gage in 1995; two of her sons, Donald Meredith Gage in December 2010, and Pat Albert Gage in January of 2001; three brothers, Cecil, Wesley and Marshall Patterson; and one sister, Ruby Patterson Miller. She is survived by one son, Kerry Alan Gage and wife, Mary Jo, Joplin; two daughters-in-law, Donna Kathryn Gage, Austin, Texas, and Shirley Mae Gage, San Antonio, Texas; five grandchildren, Mark Gage, Hendersonville, Tenn., Lisa Owens, League City, Texas, Jill Stadler, Joplin, Lori Gage, Beeville, Texas, and Lyssa Williford, Austin; 10 great-grandchildren; one great-granddaughter; and nieces, Celia Wideman and Jacque Lee, both of Magnolia, Ark. Funeral services will be at 10 a.m. Saturday at Mason-Woodard Mortuary. Mark Gage and Gary Morrison, Ministers, will officiate. Burial will be in Wild Rose Cemetery in Webb City, Mo. The family will receive friends from 6 to 7 p.m. Friday at the mortuary. Memorial contributions may be made to the Mount Hope Church of Christ. Online condolences may be made at www.masonwoodard.com.